Democratic presidential candidate Bernie Sanders drew a crowd of nearly 30,000 to a campaign rally over the weekend, dramatically upstaging competitor Hillary Clinton’s campaign launch event two months prior. 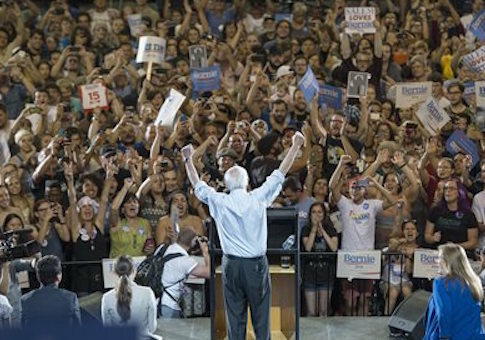 The Oregonian reported that 19,000 individuals packed themselves into the Moda Center in Portland, Oregon, Sunday to hear the Independent Vermont senator speak, while approximately 9,000 people unable to gain admission to the basketball arena listened to his remarks on the loudspeakers outside, according to Moda Center official Michael Lewellen. The crowd of 28,000 dwarfed that drawn by Clinton on June 13. During her official campaign launch event on Roosevelt Island in New York two months ago, the former secretary of State addressed a crowd of approximately 5,500 individuals, according to her campaign. As such, the audience listening to Sanders Sunday was more than five times the size of that which watched Clinton formally unveil her 2016 bid for president. In fact, Sanders’ campaign has been characterized by large crowds since its inception, while Clinton has resigned herself to appearing largely in small group settings and at town hall events. On a two-day trip to New Hampshire at the start of this week, for instance, Clinton will attend two separate town hall meetings and a community forum, outlining her college affordability plan. Sanders’ support, like his crowds, has been growing. According to a Quinnipiac University poll released in late July, Sanders has seen his favorable score jump 13 percentage points since May. Clinton, on the other hand, is enjoying her worst net favorable rating ever as she continues to battle controversy surrounding her use of a private email system while at the State Department. Significant majorities of American voters also rate her as not trustworthy and unconcerned about their needs and problems. In the state of New Hampshire in particular, Clinton is struggling against her liberal competition. A WMUR Granite State poll conducted at the end of July indicated Clinton and Sanders are locked in a virtual tie for the Democratic nomination in the state. In fact, Sanders’ support among New Hampshire Democratic voters is currently six times what it was before news broke of Clinton’s email scandal.